Available with Network Analyst license. 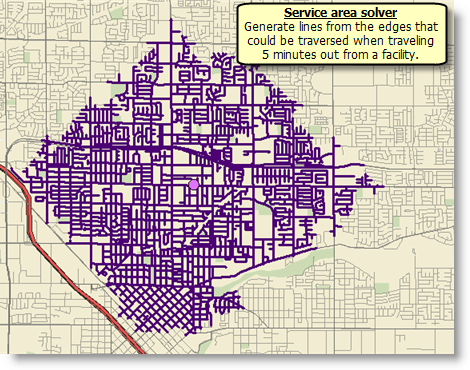 The ArcGIS Network Analyst extension allows you to solve common network problems, such as finding the best route across a city, finding the closest emergency vehicle or facility, identifying a service area around a location, servicing a set of orders with a fleet of vehicles, or choosing the best facilities to open or close. Network Analyst can find the best way to get from one location to another or to visit several locations. The locations can be specified interactively by placing points on the screen, entering an address, or using points in an existing feature class or feature layer. If you have more than two stops to visit, the best route can be determined for the order of locations as specified by the user. Alternatively, Network Analyst can determine the best sequence to visit the locations, which is known as solving the traveling salesman problem. Whether finding a simple route between two locations or one that visits several locations, people usually try to take the best route. But "best route" can mean different things in different situations. The best route can be the quickest, shortest, or most scenic route, depending on the impedance chosen. If the impedance is time, then the best route is the quickest route. Hence, the best route can be defined as the route that has the lowest impedance, where the impedance is chosen by the user. Any valid network cost attribute can be used as the impedance when determining the best route. In the example below, the first case uses time as an impedance. The quickest path is shown in blue and has a total length of 4.5 miles, which takes 8 minutes to traverse. In the next case, distance is chosen as the impedance. 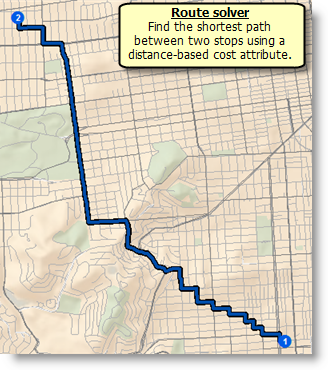 Consequently, the length of the shortest path is 4.4 miles, which takes 9 minutes to traverse. 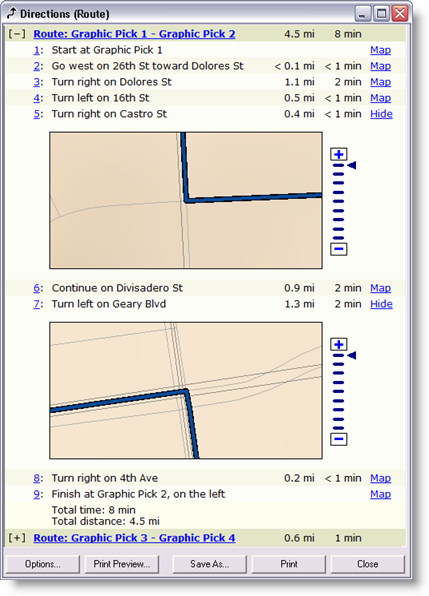 Along with the best route, Network Analyst provides directions with turn-by-turn maps that can be printed. Finding the closest hospital to an accident, the closest police cars to a crime scene, and the closest store to a customer's address are all examples of closest facility problems. When finding closest facilities, you can specify how many to find and whether the direction of travel is toward or away from them. Once you've found the closest facilities, you can display the best route to or from them, return the travel cost for each route, and display directions to each facility. Additionally, you can specify an impedance cutoff beyond which Network Analyst should not search for a facility. For instance, you can set up a closest facility problem to search for hospitals within 15 minutes' drive time of the site of an accident. Any hospitals that take longer than 15 minutes to reach will not be included in the results. The hospitals are referred to as facilities, and the accident is referred to as an incident. Network Analyst allows you to perform multiple closest facility analyses simultaneously. This means you can have multiple incidents and find the closest facility or facilities to each incident. 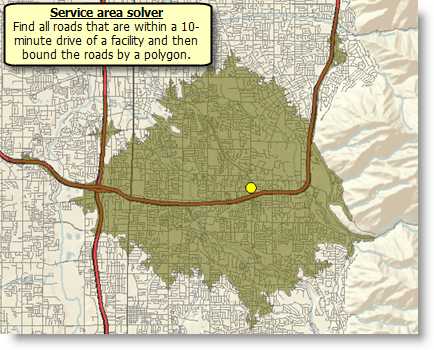 With Network Analyst, you can find service areas around any location on a network. A network service area is a region that encompasses all accessible streets, that is, streets that lie within a specified impedance. For instance, the 10-minute service area for a facility includes all the streets that can be reached within 10 minutes from that facility. Accessibility refers to how easy it is to go to a site. In Network Analyst, accessibility can be measured in terms of travel time, distance, or any other impedance on the network. Evaluating accessibility helps answer basic questions, such as, How many people live within a 10-minute drive from a movie theater? or How many customers live within a half-kilometer walking distance from a convenience store? Examining accessibility can help you determine how suitable a site is for a new business. It can also help you identify what is near an existing business to help you make other marketing decisions. One simple way to evaluate accessibility is by a buffer distance around a point. For example, find out how many customers live within a 5-kilometer radius of a site using a simple circle. However, considering people travel by road, this method won't reflect the actual accessibility to the site. Service networks computed by Network Analyst can overcome this limitation by identifying the accessible streets within five kilometers of a site via the road network. Once created, you can use service networks to see what is alongside the accessible streets, for example, find competing businesses within a 5-minute drive. Multiple concentric service areas show how accessibility changes with an increase in impedance. 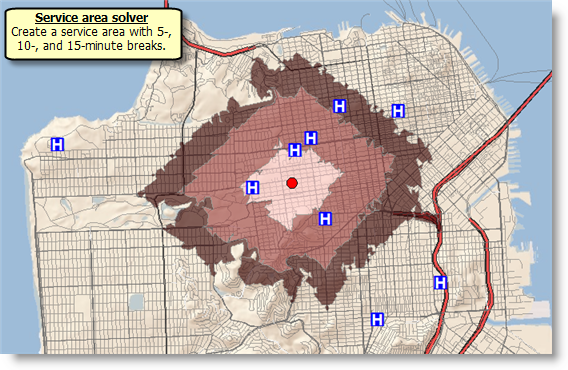 It can be used, for example, to show how many hospitals are within 5-, 10-, and 15-minute drive times of schools. By solving with traffic data, you can see which hospitals can be reached within these drive times for different times of the day. The reachable hospitals may change due to traffic conditions. 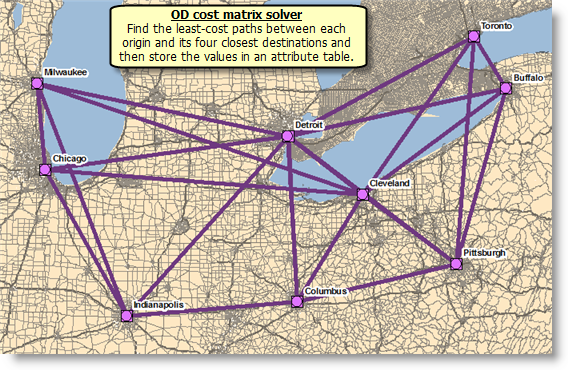 With Network Analyst, you can create an origin-destination (OD) cost matrix from multiple origins to multiple destinations. An OD cost matrix is a table that contains the network impedance from each origin to each destination. Additionally, it ranks the destinations that each origin connects to in ascending order based on the minimum network impedance required to travel from that origin to each destination. The best network path is discovered for each origin-destination pair, and the cost is stored in the attribute table of the output lines. Even though the lines are straight for performance reasons, they always store the network cost, not straight-line distance. The graphic below shows the results of an OD cost matrix analysis that was set to find the cost to reach the four closest destinations from each origin. The straight lines can be symbolized in various ways, such as by color, representing which point they originate from, or by thickness, representing the travel time of each path. The closest facility and OD cost matrix solvers perform very similar analyses; the main difference, however, is in the output and the computation speed. 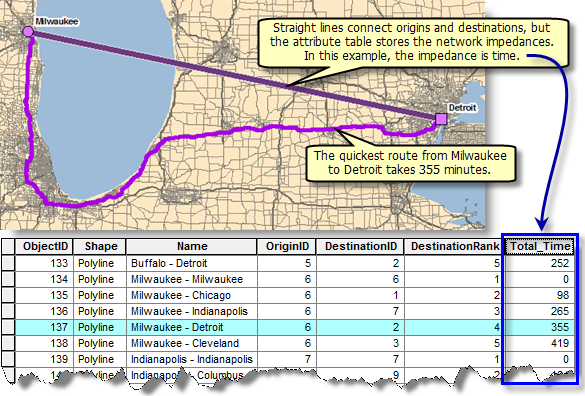 OD cost matrix generates results more quickly but cannot return the true shapes of routes or their driving directions. It is designed to quickly solve large M x N problems and, as a result, does not internally contain the information required to generate route shapes and driving directions. Alternatively, the closest facility solver returns routes and directions but performs the analysis more slowly than the OD cost matrix solver. 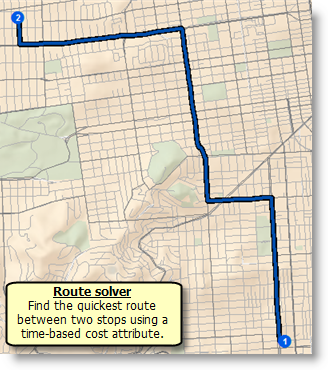 If you need driving directions or true shapes of routes, use the closest facility solver; otherwise, use the OD cost matrix solver to reduce the computation time. A dispatcher managing a fleet of vehicles is often required to make decisions about vehicle routing. One such decision involves how to best assign a group of customers to a fleet of vehicles and to sequence and schedule their visits. The objectives in solving such vehicle routing problems (VRP) are to provide a high level of customer service by honoring any time windows while keeping the overall operating and investment costs for each route as low as possible. The constraints are to complete the routes with available resources and within the time limits imposed by driver work shifts, driving speeds, and customer commitments. Network Analyst provides a vehicle routing problem solver that can be used to determine solutions for such complex fleet management tasks. Consider an example of delivering goods to grocery stores from a central warehouse location. A fleet of three trucks is available at the warehouse. The warehouse operates only within a certain time window—from 8:00 a.m. to 5:00 p.m.—during which all trucks must return back to the warehouse. Each truck has a capacity of 15,000 pounds, which limits the amount of goods it can carry. Each store has a demand for a specific amount of goods (in pounds) that needs to be delivered, and each store has time windows that confine when deliveries should be made. Furthermore, the driver can work only eight hours per day, requires a break for lunch, and is paid for the amount spent on driving and servicing the stores. The goal is to come up with an itinerary for each driver (or route) such that the deliveries can be made while honoring all the service requirements and minimizing the total time spent on a particular route by the driver. 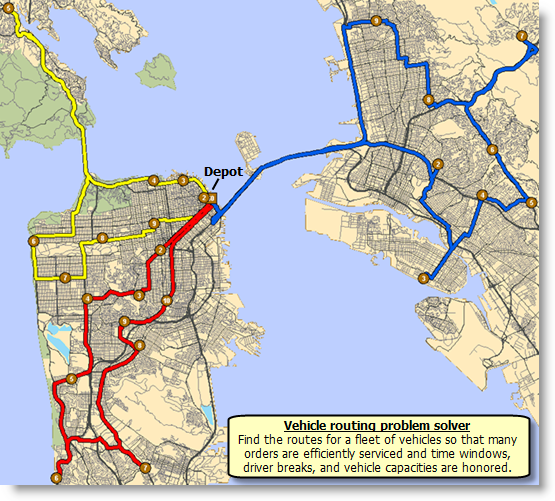 The figure below shows three routes obtained by solving the above vehicle routing problem. Given a set of existing fire stations, which site for a new fire station would provide the best response times for the community? If a retail company has to downsize, which stores should it close to maintain the most overall demand? Where should a factory be built to minimize the distance to distribution centers? In these examples, facilities would represent the fire stations, retail stores, and factories; demand points would represent buildings, customers, and distribution centers. The objective may be to minimize the overall distance between demand points and facilities, maximize the number of demand points covered within a certain distance of facilities, maximize an apportioned amount of demand that decays with increasing distance from a facility, or maximize the amount of demand captured in an environment of friendly and competing facilities. The map below shows the results of a location-allocation analysis meant to determine which fire stations are redundant. The following information was provided to the solver: an array of fire stations (facilities), street midpoints (demand points), and a maximum allowable response time. The response time is the time it takes firefighters to reach a given location. The location-allocation solver determined that the fire department can close several fire stations and still maintain a three-minute response time. Out of the current set of fire stations, nine fire stations can close, and a minimum of seven are needed for the department to still be able to respond to emergencies within three minutes. 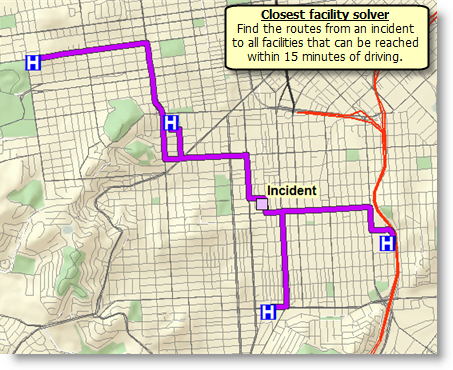 All of the solvers listed above allow you to incorporate live and historical traffic data into an analysis so you can find the best route for a given time of day; locate the best place to preposition an ambulance at 8:00 a.m., 12:00 p.m., 4:00 p.m., and so on; and generate service areas for different times of the day. The results of any analysis may change for different dates and times because traffic conditions and travel times may change.